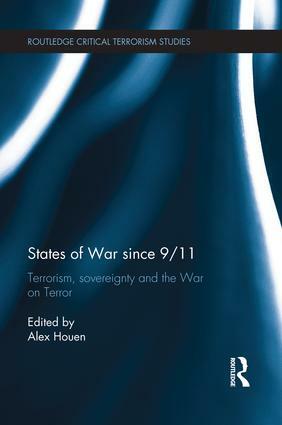 This multidisciplinary edited volume explores how the spread of the 'War on Terror' has entwined matters of state sovereignty and states of war into mutually affecting relations. Pre-emptive attacks on terrorist groups in ‘rogue’ states, ‘outsourcing’ of state militancy and the mutable state of armed conflict required to wage a ‘hybrid war’ have increasingly been issues for the War on Terror. Moreover, such measures have seen the spread of this war to countries such as Israel, Russia, Ethiopia, and Uganda, all of whom have justified their own attacks in other nation-states as a war of ‘self-defence’ against terrorism. States of War since 9/11 offers a timely, innovative analysis of how the War on Terror has taken on different modes of militancy and militarisation in spreading to different nation-states and regions. Featuring a multidisciplinary line-up of eminent contributors, the book ranges in reference from the early stages of the war up to France’s 2013 intervention in Mali. Part One examines the various modes of war and militarisation that have been employed in particular nation-states, including Afghanistan, Russia and Chechnya, and Israel and Palestine. Part Two examines how the war’s innovations have more generally involved ‘just war theory’, biopolitics and sovereignty, networked battlespace, new military urbanism, citizenship, homeland security and surveillance. Overall, this book offers a fresh insight into how states have attempted to secure their own bounds by extending the boundaries of war itself. This book will be of much interest to students of critical terrorism studies, foreign policy and IR in general.